Royal Caribbean International, Azamara Club Cruises and Cruise Nation were multiple award winners at last night’s Wave Awards, which reward excellence in the UK cruise industry. Royal Caribbean took home the top prize for Best Ocean Cruise Line and also Best New Ship Launch for Harmony of the Seas in May last year. The line’s third award was for Best Family Cruise Line. Azamara Club Cruises received a double honour, picking up both Best Specialist Cruise Line, as agreed by an independent judging panel, and Passenger Favourite Specialist Cruise Line, as voted by the public. Swansea-based Cruise Nation triumphed with Best Online Travel Agent and Best Digital or Web-based Service or Platform. In all, 34 awards were collected at the black-tie ceremony, which took place at Kensington’s Royal Garden Hotel and was attended by 340 of the cruise industry’s movers and shakers. 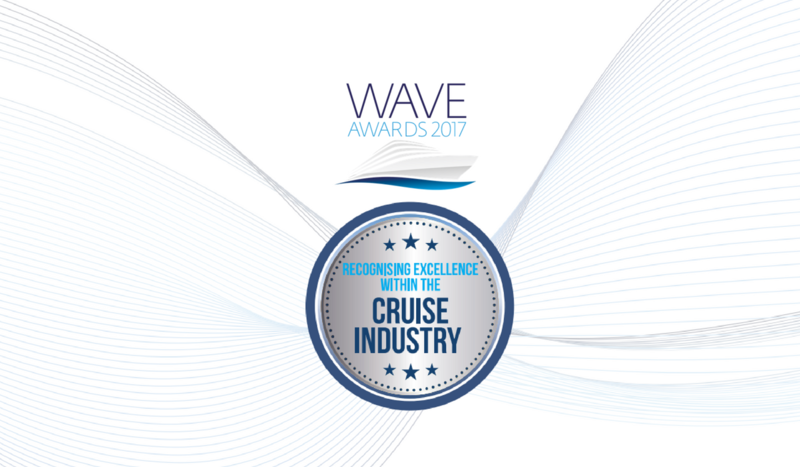 It was the second annual Wave Awards – the event is owned by Real Response Media Cruise, publishers of World of Cruising, Cruise Trade News and Cruise Ports & Destinations. Apart from seven Passenger Favourite awards, the majority are based on rigorous assessment of submitted entries by a panel of cruise travel experts. Celebrity host, the comedian Marcus Brigstocke, added his unique brand of humour, as the winners took to the stage. A prize draw was held in aid of floating hospital Mercy Ships, with top prizes a Cruise & Maritime voyage for two and a Thomson Cruise for two. The awards kicked off with four Ports & Destinations categories, when ABP Southampton led the way with Best UK Departure Port. In the seven Onboard categories, Oceania Cruises beat off the competition to pick up Best Cuisine, and Norwegian Cruise Line shone with Best Entertainment. Next came Passenger Favourites and seven awards that were voted for by the readers of World of Cruising magazine. Bolsover Cruise Club was named Favourite Agent, Greece Favourite Destination, Viking Cruises Favourite River Cruise Line and P&O Cruises Favourite Ocean Cruise Line. The seven Industry categories included an honour for Stacy Day, Readers Offers Cruise as Best Individual Cruise Consultant, with a High Commendation for Zoltan Biczo, Ponders Cruise & Travel. Titan Travel won Best Escorted & Specialist Tour Operator. The night culminated with nine Cruise Line categories – Seabourn picked up Best Luxury Cruise Line, Princess Cruises Best Premium Cruise Line and Silversea Expeditions Best Adventure Cruise Line. Best Advertising, Marketing or PR Campaign: Cunard, Queen Mary 2. Remastered.